"If you take the time to listen, the land will speak to you." That is the first sentence of the chapter on Bunny Williams' sunken garden in her book, An Affair With a House. She then goes on to say that she did not follow her own advice when she was starting this garden. She was (and still is) an impatient gardener. But little by little, aided by an unerring sense of scale borrowed from her work in decorating, she has created a stunning formal sunken garden. An elderly neighbor told her that the site was originally used for tennis. 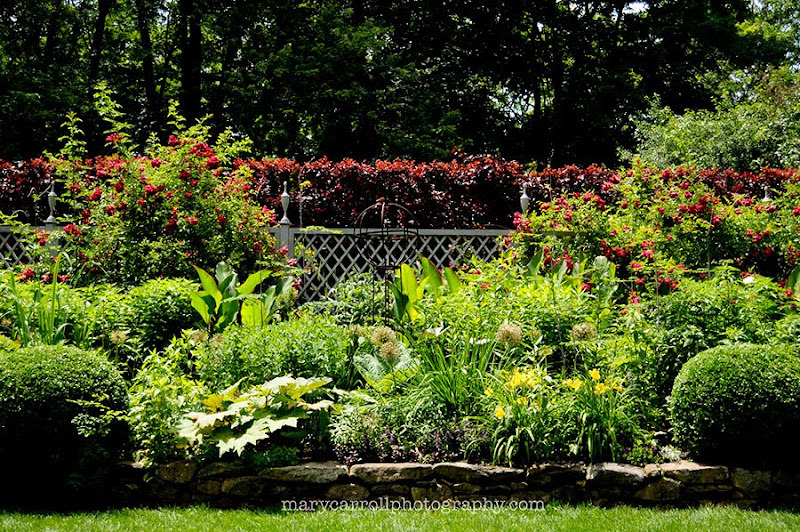 Miss Williams added two facing perennial borders, backed with a lattice fence. Next came a stone wall, which made the garden seem more like an enclosed room. Finally, a small rectangular pond, surrounded by stone paving and an evergreen hedge was added to pull the two borders closer together. A lattice archway with facing benches leads through a yew hedge to the more wild area beyond. In the photos above, you will note the formal layout of the garden. One of the double borders is shown, with it's hot color scheme of reds and yellows. A pair of beautiful lavender hydrangeas flank the entrance to the garden, and the small pool is inhabited by a school of huge carp. Oh Mary, this garden is just stunning! The pond, the old stonework...just stunning. Thank you for sharing this. What a stunning garden! 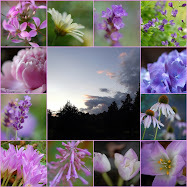 Your pictures are beautiful, I always enjoy your captures, Mary! Wow, what a stunning garden! I'm glad to hear she didn't follow her own rules too...that sounds like my kind of garden! Thanks for having me today, Mary. Hope you have a lovely week. What a beautiful place to live! I have made a note to go back and look at all the other pictures you have posted about your visit. Again - thanks for sharing your trip there. Also, thanks for hosting again this week. You are appreciated. I have been enjoying all your posts about Bunny Williams' beautiful garden and her gorgeous home, Mary She has made everything is outstanding! I'm sure glad you went to visit Bunny Williams' place. I believe the sunken garden is my favorite so far! 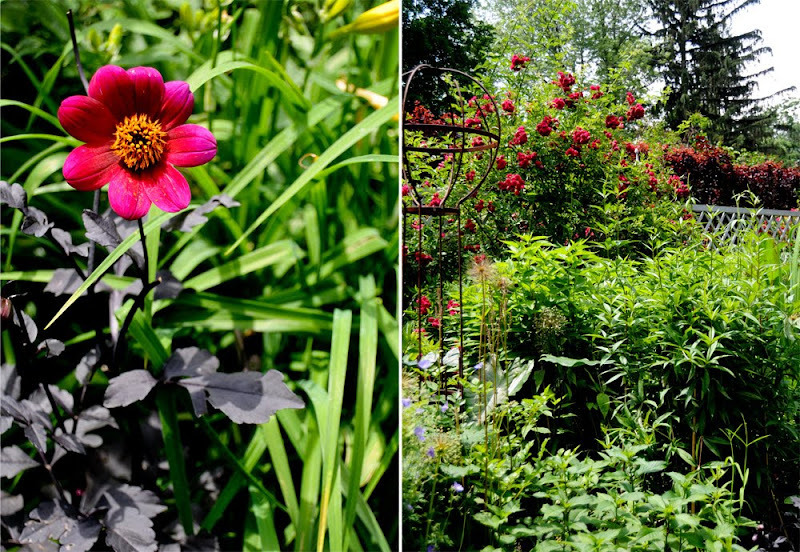 I'm always in awe of people to create beautiful gardens. This one is beautiful. Hi Mary, Thanks for hosting and posting more beautiful photos of the garden. I am so surprised that she describes herself as an impatient gardener. She has certainly created a beautiful garden impatient or not. Amazing what one can do with abtennis court!! Beautiful photos. Such beautiful pictures...I especially like the gold fish pond!! What a vibrant pool! Wonderful gardens - so formal. Greats shots of them. What an enchanting Garden! And your photography of it as always is superb! Ohhhhh tennis. I can see that. Although I MUCH prefer this version. Everything there just looks amazing. Oh to have a garden like this! As long as I had a team of gardeners, it would be a dream come true. Beautiful photography Mary, thanks for sharing Bunny's gardens. These garden are so beautiful. Just magical. Thank your for sharing and thank your for hosting MM. What a treat to see this garden - I love the formality of the layout, although I would never choose anything the least formal for my garden. Mary, this looks like such a refreshing place to visit! Beautiful. Paradise with all the Hydrangea. 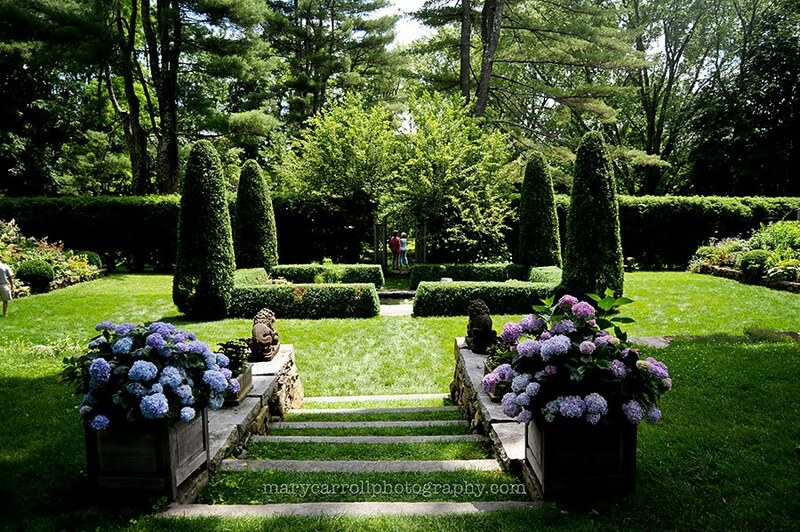 Mary, what magnificent photographs to celebrate a beautiful garden. How lovely. Wow! What a beautiful place! I love gardens. What a wonderful garden! And great photos. Thanks (again) for sharing! I have really enjoyed our visits to Bunny Williams' house and gardens this week, you have captured everything so beautifully with your amazing photography. Many thanks for taking me along & also, of course, for hosting MM. Mary that garden is amazing. Because of you I am now a big fan of Bunny Williams. What a wonderful visit. Thank you for hosting your wonderful party. Oh that Bunny, she knows her onions. Yes, my land does speak to me. Right now it is hollering, HELP! HELP! No, really -- it is. Beautiful garden ... and you can play tennis at the park. I really need to get this book, don't I? HOT one today! I'll be down in the cellar continuing the Great Pre-French Drain clean out. My life's a glamorous whirl. I've enjoyed touring Bunny's home and garden through your eyes, Mary. I'd love to visit her property and experience the beauty for myself. Thanks for sharing and for hosting this lovely party. Wow! Its a picture perfect garden... a nature's haven of sorts. Lovely Pix. Loved the Topiary n the beautiful greens ard. Lovely garden you are showing! Such a lovely place! Thanks again for hosting! looks like it was a beautiful day... your photos from all the posts are lovely! Here, but late. I love succulents!